Pretending to be Normal: Living with Asperger's Syndrome – expanded edition. 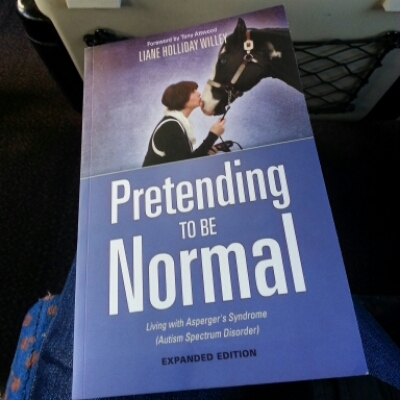 Yesterday’s book-on-a-train was Pretending to be Normal, Living with Asperger’s Syndrome (Autistic Spectrum Disorder) by Liane Holliday Willer – the new expanded edition. The original book came out in 1999 so there’s an additional 15 years of reflection on AS life to be added. Compelling and witty, Liane Holliday Willey’s account of growing to adulthood as an undiagnosed ‘Aspie’ has been read by thousands of people on and off the autism spectrum since it was first published in 1999. Bringing her story up to date, including her diagnosis as an adult, and reflecting on the changes in attitude over 15 years, this expanded edition will continue to entertain (and inform) all those who would like to know a little more about how it feels to spend your life `pretending to be normal’. There’s a bittersweet aspect to reading books like this for me today. On the one hand I’m discovering that I’m not alone in my experience of a life misunderstood. That there are others out there for whom a diagnosis of Aspergers or ASD is not a sentence or label, it’s an explanation and a way to come to terms with yourself. On the other hand, I’m discovering that so many of us have struggled alone for so very long. Unlike many people coming to a diagnosis later in life, autism was not an unknown to me. My first full time job was as a care assistant in a residential unit for autistic people, many of whom had themselves languished for years misdiagnosed in cavernous mental hospitals. They were often very broken people, but they were broken by the treatment they’d experienced, rather than the disorder they actually had. With it being a high care residential unit, I didn’t encounter many people with an autism diagnosis who were capable of independent living. Aspergers was something discussed, but not seen. I still thought I understood autism. I never saw myself in it. Years and years later, parenting, I began to explore the spectrum more thoroughly. As a computer programmer (red light there) I’d encountered many quirky loners who would undoubtedly recognise themselves in the stereotypical description of aspergers. And I did online tests that said I was borderline, but women didn’t have it, did they? (I didn’t find Pretending to be Normal then. I wonder how different life would have been if I had.) I turned away. My children’s stories are not mine to tell in detail. That may seem a strange thing to say on what is often labelled a parenting blog, and indeed the earlier entries go into much more detail. But as my audience widened and included people I’ve never met, and my children grew, I reduced the detail, and it is up to them to disclose what they want to. My daughter has written about her own aspergers here. Even then, even when she was diagnosed, no one looked at me. I’m very good at passing for normal. I think. Maybe eccentric, quirky, unusual, but more or less normal. Even though it exhausts me. Maybe in 15 years time I’ll understand myself better and I too will be a woman with “residual Asperger’s Syndrome”. But then again, given that I’ve yet to access any support, and my daughter has been offered none, I’m not sure how I will reach that situation. I am jealous of the people writing books who have had such expert assistance in coming to their understanding. I don’t like being jealous. It’s ugly. Is it so very different in different countries? Are there therapists, and support, and does a psychologist do more than send you a post diagnosis pack? (Yet to be more than glanced at. I can’t assimilate it.) Are there treatment plans for children, social support groups, actual assistance? Disclosing my Aspie nature here and on social media has brought me little connections with my tribe, many women who have also come late to this knowledge. I cannot help but feel some sadness for all our misunderstood years. The women who come to acceptance easily, it seems to me, are those whose families accepted their differences and worked to smooth out the bits that hurt with that acceptance, if not understanding. Not everyone was surrounded by that acceptance, and that is something I’ve yet to come to terms with. This book, like Nerdy, Shy and Socially Inappropriate is both memoir and self help guide. It’s invaluable for those within the spectrum, as well as those outside it. I’d like for every teacher to read them, and maybe understand some of those alone children a little better. I’d like for every parent to read them, so as maybe to be a little more accepting of the quirks of human nature. I’d like for everyone to understand the autistic spectrum, and for the world to become a more understanding and tolerant place. So many of the adaptations that can ease autistic people’s lives actually benefit NT people too. Like in the swimming club, where giving clear step by step instructions let an autistic child participate, and was discovered to enhance the other children’s learning too. Whether you are autistic or not, have family or friends with autism, you could learn much from this book. I highly recommend it. I’d never come across this one before. Wish I had. What I find so interesting is that it never occurred to me that other people were different. I remember advising young recruits in work to get step by step instructions from the boss, because I needed them, but perhaps they didn’t? Possibly not. I tend to the idea step by step instructions are useful for anyone but maybe they’re not? Oh, now I’m going to disappear in a tangle of ununderstandings. This!! I’ve been told so many times ‘yes, but a Tech, most people don’t think like you’ and all I can think is why ever not! That is a really interesting read. I am just starting to go through the process with my son as I am pretty certain that he has Apergers. I am definitely going to read this, thank you for the recommendation. You might also like the Nerdy, shy and socially inappropriate I linked to. Both female authors, will have a look for male accounts. I’ve just finished reading The Rosie Project and of course I read the one about the dog in the nighttime years ago. My cousin was diagnosed with Asperger’s aged 55 and he was delighted s it explained a certain social awkwardness (I think he also thought it made him a genius – which he isn’t). I’m wondering if women feel the pain of being an outsider more, if it bothers them more? I could understand if that were the case. I don’t think I can answer that in a comment. A lot rattling round in my head about it all just now, may well write something up.